When you think about it, energy is perhaps the most valuable commodity on the planet. Humans go to extremes to make certain that they have an excess of it on hand, whether it's to fuel their economies, their vehicles, or themselves. Just consider what you'll do to make sure you have your morning coffee or your pre-workout energy booster—and what you'll be able to achieve once you've consumed them. But while our complex modern lives run on energy, the sources of that energy are often things that are ancient and elemental-think wind, sun, coal, or oil. Fitness supplement manufacturers also tend look backward, to ancient healing traditions, to find the next great performance booster. 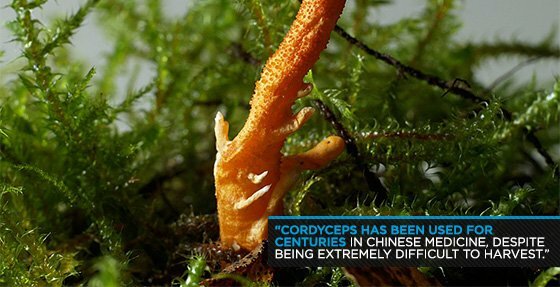 One such discovery is the cordyceps fungus. Cordyceps has been used for centuries in Chinese medicine, despite being extremely difficult to harvest. After all, it is normally found on the surface of high-altitude caterpillars, leading to its nickname of the "caterpillar fungus." For most of the 20th century, it was a highly prized, expensive, and elusive nutraceutical. However, after a couple of high-profile success stories and the development of an effective way to produce cordyceps in the laboratory, it has been earning fans around the world. Here are a few compelling reasons that athletes of all types should consider supplementing with this potent fungus. Adenosine triphosphate (ATP) is the energy currency of your muscles. It is also the go-to fuel for any short, explosive activities like jumps and sprints. One of the active ingredients of cordyceps is adenosine, a nucleic acid that is a crucial component of ATP. According to a 2007 study out of the Hong Kong University of Science and Technology, cordyceps can significantly boost up your body's ability to produce ATP, which can help anyone from elderly people looking to stay active, to elite world-class competitors. What does this mean to you? Part of the reason you "fail" during sets is because your body can't generate enough ATP to keep up with the intense demands you place upon it. By boosting ATP generation, cordyceps can extend the length of time you can lift heavy weights. This means more personal bests, as well as enhanced growth through greater muscle stimulation. It's no secret that the testosterone hormone is crucial for supporting maximal muscle growth. Cordyceps has been shown in a handful of animal studies to boost T levels by stimulating the body's natural T factory (the Leydig cells in the testicles). The ancient Chinese were hip to this one, even if the precise anatomical pathways weren't hammered down and named just yet. 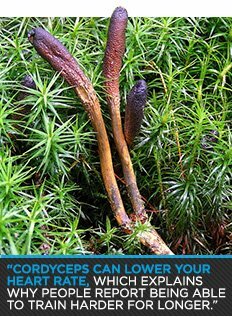 Cordyceps has been used commonly as a treatment for sexual dysfunction, as well as an energy enhancer. Today, many studies have shown us that the two go hand-in-hand. Improved testosterone levels increase the ability to add muscle mass, but they also enhance a sense of well-being in many guys, as well as promoting reproductive capability. Yes, cordyceps can help both you and your swimmers get stronger. That's a complicated way of saying this mushroom has the potential to decrease your suffering while you struggle to reduce body fat. If performance is your priority, it may help there, too. Just ask Chinese Olympic Athletes Wang Junxia, Qu Junxia, and Zhang Linli, who smashed five world running records at the 1993 games. Authorities were suspicious, but the athletes passed all drug tests. Their secret, they said, was an extract of cordyceps. In the last decade, a number of Chinese studies have backed up the performance benefits of this mushroom. One, published in 2004 in the journal Medicine and Science in Sports and Exercise, found that cordyceps improved athletes' oxygen utilization by as much as 50 percent. Another study published in the same journal in 1999 found that elderly patients taking cordyceps experienced a nine percent increase in aerobic capacity. A number of studies have also shown that supplementing cordyceps can lower your heart rate, which explains why people report being able to train harder for longer periods when taking this supplement. Another study published in 1999 in the Journal of Alternative Complementary Medicine also pointed to long-term cardiovascular health benefits from cordyceps, indicating that it can lower total cholesterol by 10-20 percent and increase HDL by a quarter. Herdsmen in ancient Tibet supposedly noticed that their yaks seemed to become energized when they grazed on cordyceps mushrooms. This helped build the reputation the mushroom has carried to this day of being an effective stimulant. Users say that in supplement form, cordyceps gives a boost similar to caffeine, but without the side effects of jitters or an inability to sleep several hours later. One of the reasons for this is that cordyceps attaches to the same receptors as caffeine, providing a noticeable feeling of enhanced energy. This is one reason that it's popular as an anti-aging supplement in China. One study from that country in 1993 found that among elderly patients suffering from fatigue, an amazing 92 percent reported an improvement in their symptoms in 30 days. Though Eastern healers have been touting cordyceps for a long time, Western medicine is just growing acquainted with this fungus. So while it shows promise as an antioxidant, anti-aging treatment, and perhaps even as an anti-cancer treatment, we have yet to plumb the depths of its potential benefits. Cordyceps hasn't found the popularity of other testosterone boosters such as fenugreek or energy boosters such as caffeine—at least not within the bodybuilding community. However, you could potentially derive the testosterone and energy benefits of those other supplements by taking a product that contains cordyceps as part of a multi-ingredient formulation, or a stand-alone. 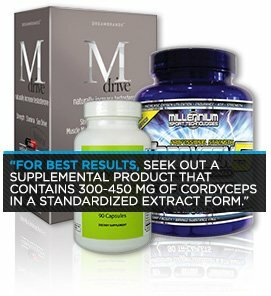 For best results, seek out a supplemental product that contains 300-450 mg of cordyceps in a standardized extract form.